Optoma HD27 can be considered as one of the most versatile multimedia projectors that are available in the market. The amazing color technology and convenience in setting up has contributed a lot towards its popularity. In other words, this projector has the ability to reproduce true colors. It comes along with compact dimensions as well and is ideal for the people who are looking forward to enjoy movies or play games on the big screen. This projector weighs about 2.5kg and you will be able to carry it wherever you go. Here is a quick Optoma HD27 Review to explore this latest multimedia projector’s features, specification and performance. 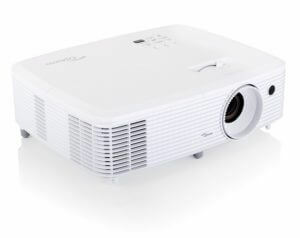 The Optoma HD27 is equipped with Full HD 1080p resolution with 3200 Lumens brightness and 25,000:1 Contrast Ratio. Therefore, all the people who use this projector will be able to get detailed HD content without compression or downscaling. If the projector is switched off accidentally, the quick resume functionality would come to your survival, which becomes useful when viewing documents, photos and movies. The dynamic black technology of Optoma HD27 adjusts the lamp output depending on the brightness information captured from each frame. This helps the projector to create an excellent contrast ratio. In other words, the bright scenes would appear clear and crisp whereas the dark scenes would come with deep blacks. On the other hand, this projector is designed in such a way to power off automatically while it is not being used. This will help you to save energy while increasing the durability. The developers of Optoma HD27 have enhanced the lamp life of this projector as well. The lamp life rated at impressive 8000 hours that should last over 10 years on moderate usage. Another most impressive feature about Optoma HD27 is its integrated speaker. The built-in speaker comes with powerful 10W output, eliminating the need of external speakers. Coming to connectivity options, the device is paired with two different HDMI inputs, which can be used to connect with a gaming console, media streamer, Blu-ray player and a laptop. Or else, you can simply connect it to a HDMI dongle such as Amazon Fire TV, Google Chrome Cast and Apple TV. Optoma HD27 can be considered as one of the smartest projectors available out there on the market. That’s because the users can simply turn it into a smart display by connecting Apple TV or HDCast Pro, which is being sold separately. Then you will be able to stream music, videos and photos on the big screen through your tablet or smartphone. The smartphone or tablet can be connected with your projector through a cable called MHL. If you give a 3D source as the input, you will be able to experience true 3D content from it. This rapid refresh rate of 144Hz has contributed towards the quality of 3D content. This projector is powered with wireless technology as well. If you purchase WHD200, which is sold separately, you will be able to get rid of the hassle associated with cables. It also has a dedicated gaming mode, which can highlight the details to help the gamers. These impressive functionalities have made Optoma HD27 one of the most popular multimedia projectors available out there in the market.